From the moment you step on our lot until the time you drive away in your next car, your buying experience with J.M. Uvanni Motors is our number one priority. We encourage you to use the expertise and resources of our sales staff; they are here to help you find the right car at the right price. Call us today at 315-339-0650 to schedule your test drive! Our veteran finance manager is committed to achieving 100% financing in our F & I department. Ellis is experienced in financing vehicles for every budget and can get the best possible interest rate for our customers by maintaining a vital relationship with all of our bank representatives. He negotiates rates and terms to best suit the customers needs that only an experienced finance manager can do. Ellis is a great listener when it comes to our customers needs. He is excellent at designing a customary service contract to fit your vehicles needs. Besides managing our F & I department, Ellis has 9 years experience as a used car manager. His sales skills have provided a platform into the F & I office. He maintains a healthy client base and continues to build clientele with his referrals due to his impeccable customer service. Ellis has been with our company for 14 years, starting in sales before being promoted to his current position. Having extensive training and attending numerous seminars, his knowledge regarding the purchase and financing of your next vehicle will be beneficial to your transaction. Kait Hatzinger has been employed by Uvanni Motors part-time since June of 2017, mainly supporting the business with clerical duties and customer service. She started her employment via an internship through Oneida County Workforce Development and was subsequently hired permanently. Kait is a 2013 graduate of New Hartford High School, currently pursuing a BA in Business at Morrisville State College, Majoring in Automotive Management. 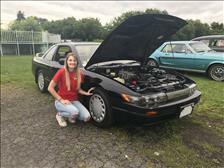 Her studies have included several hands on Automotive classes, including Chassis 1 & 2, Electronics 1, 2, & 3, Electronic Fuel Systems, Internal Combustion Engines, Welding, and Automotive Body Shop. Additional Automotive classes include Automotive Industry Awareness, Automotive Shop Management & Supervision, Auto Parts Inventory & Management, as well as Automotive Fleet Maintenance. Taylor Uvanni started at her families auto dealership in 2016. She over looks and handles all of the clerical duties here at the dealership. when you call the dealership, Taylor will be the welcoming voice you hear as she is responsible for directing your calls. Apart from the dealership she also enjoys spending time with her friends and family. If you have any questions or need any help feel free to call Taylor and she will help you with any of your dealership needs. Jennifer attended Morrisville State and Utica College. She has 25 years of experience in the accounting and financial analysis field, working with a variety of clients across several industries. She has been working with Uvanni Motors since 2008. She and her husband Chad, live in Camden with their 4 daughters. Kelley is probably the most familiar face of our staff. She is an integral part of our company being involved in our media advertising, and appears in our television and radio ads. Kelley oversees all of our branding and advertising as well as sales, marketing and fundraising. Most importantly she implements and maintains company culture by working closely with our staff. Customer service is important to our dealership, and Kelley is committed to the continuation of our successful family owned and operated dealership. Kyle S has been our automotive technician in our dealership for 3 years. He has 6 years of professional experience. Kyle started his interest with the automotive industry when he was just 10 years old. He turned his childhood passion into his career. He has an extensive collection of tools to help diagnose and solve your automotive needs. He also has the lastest technology to ensure that your next vehicle will remain road worthy and safe for you and your family. Gary's father, James M. Uvanni Jr. (Moose) started this company in 1972. Moose was passionate about family and wanted a business that reflected his values in everyday interaction, his experience in car sales laid the platform into this company. Moose taught all of his boys, the Late James M. Uvanni lll, Michael J. Uvanni, Paul J. Uvanni, and Gary W. Uvanni, the value of great customer service as well as many life lessons that they would all need to succeed in life. The foundation of our company today still stands on what Moose had implemented in 1972. We are proud to serve you, and our service we provide to you will reflect what Moose stood for. Gary started working for his father in the reconditioning and mechanical departments when he was just 16 years old. After his father's passing in 1989, James,Paul, & Gary, kept the dealership going to honor their fathers wishes. 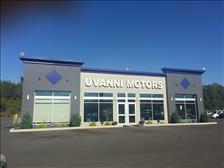 Eventually, James Uvanni went on to purchase two new car franchises. During his years of ownership, he has shared his knowledge for success with his brothers. Paul Uvanni owns Victory Chrysler Dodge Ram in Rome, NY. Gary found it vital to keep the company that his father started in 1972 in business and it has grown substantially to a store that reflects a new car store. Uvanni Motors success is due to Gary's father, the mentor-ship from his brothers and the continued commitment and sacrifices that Gary has made to this company. He has tirelessly put in long hours and leads his employees by example. No job or work within the company is below him. He is hands on with every aspect of the company and is often involved with every transaction and sale.